To some homeowners, storage can be considered invaluable, especially when it comes to closet space. All that “stuff” we as homeowners collect needs a place and not out in the open for everyone to see. 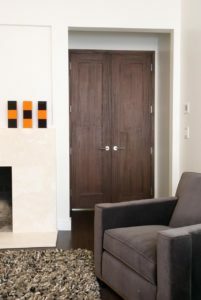 That brings us to the closet door, an item that can be overlooked when developing an interior décor plan. Why Style Your Closet Door? Closet doors offer an opportunity to add a unique look to your bedroom. Keep in mind that closet doors are typically a large feature in your room. In looking at the closet door as “wall art,” you can easily create a statement and add to both the aesthetic and functionality of the room’s decor’. If you’re considering a complete overhaul, this may require more than just a coat of paint and a little bit of time. 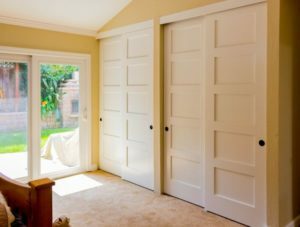 Enlisting the help from a professional who can install your new door, especially if it’s a sliding closet door where work will need to be done on the existing wall or a change in door structure is one approach. 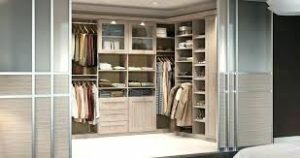 There are many options when it comes to updating your closet and bedroom. Additionally, there are many DIY options when it comes to decorating your closet door that will give you a new style in no time at all. Closet sliding doors are a great way to save space in your room. Sliding doors do not fold out like a traditional accordion door, creating more usable space especially in smaller bedrooms. 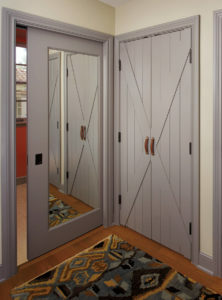 For larger rooms, the barn door look makes a statement on the wall. 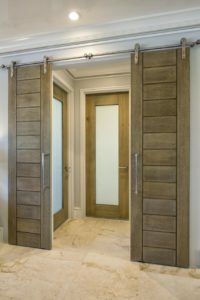 While the traditional barn door is rustic in nature, today’s “barn door” can be sleek, contemporary and modern to compliment the existing theme in your room. 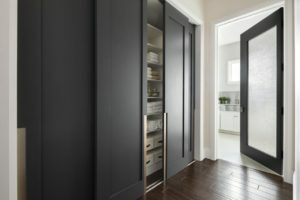 When it comes to sliding closet doors, there are typically two options. One option is a “pocket door” when the door slides into the wall. These doors disappear into the wall so it’s completely out of the way when needed. This option does involve some restructuring of the wall itself, so it’s best to contact a professional. The second option is to hang the door with a closet door roller kit, where the door slides outside of the wall. Either way, both options are attractive space savers. If you are looking for a room update that never goes out of style, consider French Doors. French doors open outward into the room leaving a large space for you to enter or look into your closet. Add molding to the door to frame it further or paint it a sleek white to keep your French closet doors looking clean and timeless. This creates a simple yet sophisticated look. 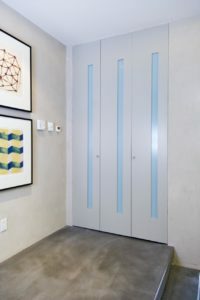 Contemporary rooms will benefit from a modern glass closet door. Frosted glass sliding doors are a popular option for homeowners who want to hide their storage space while giving a new look to their room. Another option is layered glass. 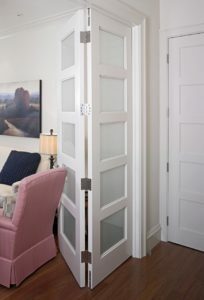 Layered glass can often be framed as a traditional door with wood. Fall in love again with bi-fold closet doors with their classic style and space-saving functionality. The doors are fitted to runners, and when opened they slide and fold at the same time for seamless operation. This means that you don’t have to make as much space for the door to swing open like normal hinged doors or French doors. 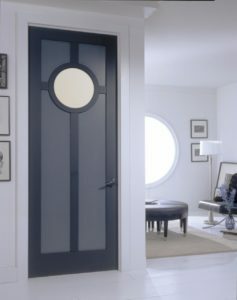 Depending on the configuration chosen, many bifold doors feature what is known as a “traffic” door. Essentially, this is a conventional door built into the bifold system, which sits on a normal hinge and has a standard lever handle. This allows for quick and easy access through the entrance way when you don’t want to fold and slide open every single leaf in the bifold. This is particularly useful for busy entrance ways which you tend to use regularly. Is there a color you really love but are too hesitant in painting an entire room? A closet door is a great way to accent a room with a bright color without risking it all. You can repurpose any style of closet door with a fresh coat of paint. Bold colors like red, yellow or purple work well in contemporary rooms as accents to black and white. Light pastels can be soothing and will work well in rooms with neutral tones. If you’re feeling creative, try incorporating a horizontal stripe design to really give your doors a unique look. 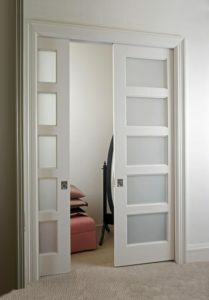 For those who desire a mirror to see an outfit from head to toe, a closet mirror door is the solution. Not only does a mirrored closet door help you walk out the door looking great, but it also adds light and décor to your bedroom. Changing out closet doors is an effective way to update a room. There are plenty of ways your closet can make a statement and enhance decor without sacrificing space. Upgrade your closet door today and see what a difference it can make in your room. Call Tree Court Builders Supply at 636-225-7717 for your closet door and hardware needs.